Ryan Tafazolli in action for Posh against Walsall. Photo: Joe Dent/theposh.com. Centre-back Ryan Tafazolli insists Peterborough United are a ‘gnat’s whisker’ away from putting together a winning run. Posh haven’t won in eight competitive matches heading into tomorrow’s (October 8, noon kick off) League One clash with third-placed Bury at the ABAX Stadium, a match that will be televised live by Sky. Ryan Tafazolli in action for Posh against MK Dons. Photo: Joe Dent/theposh.com. 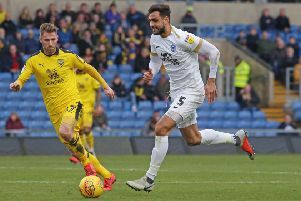 Posh have only won two of nine home matches this season, but Tafazolli is convinced that run will soon come to an end, as long as they players keep believing in themselves. “Ninety per cent of the time we are the better team in a match,” Tafazolli stated. “We have played some great football, but we just need the ball to fall our way in both boxes and we will be off and running. “We probably need to start games faster with a good tempo and set the pace for the match. When we score first we usually go on to win so it’s important we hunt that first goal from the start. We need to kick off with all guns blazing. “You’ve heard it all before, but we need to be more ruthless in both boxes. but I honestly believe we are a gnat’s whisker away from picking up points on a regular basis. Michael Smith is away with Northern Ireland this weekend. “I’ve been in a few dressing rooms in my career and believe me this one is strong. The manager has instilled great belief in the players and as long as we keep believing in what we are doing we will be okay. “Personally I’ve settled in really well off the field, but it’s been frustrating on it with an injury and a suspension. Tafazolli is expected to start against Bury alongside Michael Bostwick at the heart of the Posh defence. Hayden White will stand-in for Michael Smith at right-back. Smith is on international duty with Northern Ireland who face World Cup qualifying matches against San Marino (home, Saturday, October 8) and Germany (away, Tuesday, October 11).